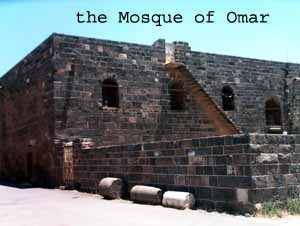 DJAMl' IL-OMARI or MOSQUE OF OMAR. 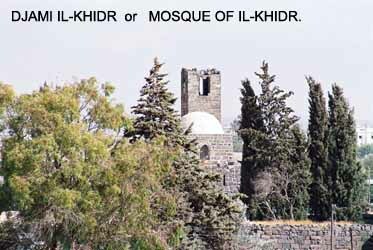 DJAMI IL-KHIDR or MOSQUE OF IL-KHIDR. 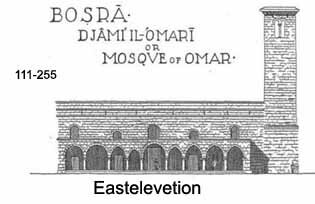 The Mohammedan (Islamic) architecture of Bosra, that is the mosques and the Castle, is almost all of the later Mediaeval period. The mosques are the earlier; most of them being apparently of the 12th. century. There is an undated inscription in the Djâmi il-OmarI, in Cufic characters that may be of the 9th. or 10th. century. Another Arabic inscription mentions four inns that were built in 561 A. H., that is 1165—66 A.D. The Castle belongs unquestionably to the 13th. century. 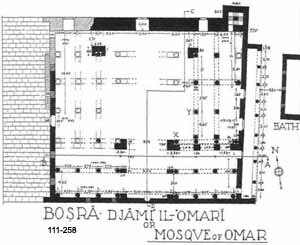 The mosques inside the walls, of which there are ruins, or other records, were eight in number as follows: the Djami il-Omari or the great Mosque, the Djami il-Khidr, the Djami Fatmeh, the Djami il-Mebrak, and id-Dabbaghah, all of which are given in red on the Plan of Bosra, a small tomb mosque beside the Birket il-Hadjdj, near id-Dabbaghah, which bears a dated inscription of the year 654 A. H. or 1256 A. D., the little mosque in the Castle, and the Djami' il-Kandil, or "Mosque of the Candlestick", which is known only from being mentioned in an inscription of the year 561 A. H., 1165-66 A. D.; but which was, in all probability, situated near the Central Arch which is still called il-Kandil by the natives; the arch perhaps formed the front of the mosque, and the ruins to the south of it may be the ruins of the Djami' il-Kandil. 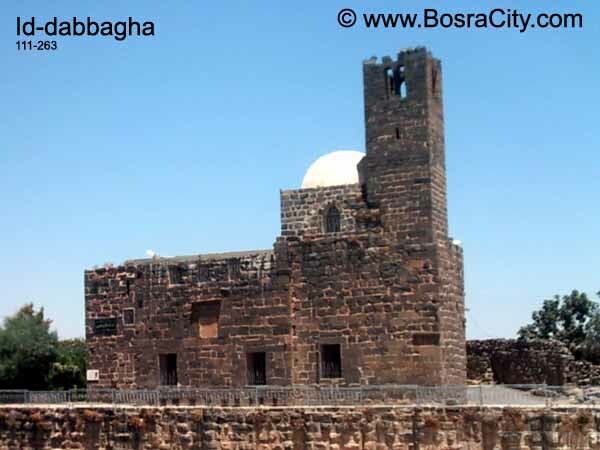 As I have said in the introduction to this part, the construction of mosques in Bosra followed the ancient methods of construction that had been known in the Hauran for at least seven hundred years before the Hegira. The leading structural principle in all is the principle of the girder-arch and the flat roof of stone slabs. The ground plans vary greatly, there are round arches and pointed arches; but the ancient arch-and-slab construction obtained in all. Two at least of the later mosques could boast of domes, as we learn from earlier writers; but the dome was used in connexion with the old system of roofing Almost all of these buildings were built of second-hand materials and, for that reason, they are difficult to date wherever inscriptions are lacking; and the use of ancient carved ornament in a slovenly and unsystematic manner, while lending a sort of pictu-resqueness to the mosques as ruins, detracted from their beauty as monuments of Islamic architecture. some later period, by an arcade of pointed arches carried on piers and set directly beside it on the south. All these later columns and piers are marked (L) on the plan, and are shown in broken lines in Section C-D. This reinforcing arcade served, like the wall arcade, to narrow the space to be spanned by the stone slabs of the roof (111. 256). These two south aisles extended through the building from the east wall to the west; the east aisles terminated at the arches of the inner south aisle. The arches of the first two bays are of unequal width, both are semicircular, but the narrower is stilted. Their common support is a column of extreme slenderness in white marble (Y). 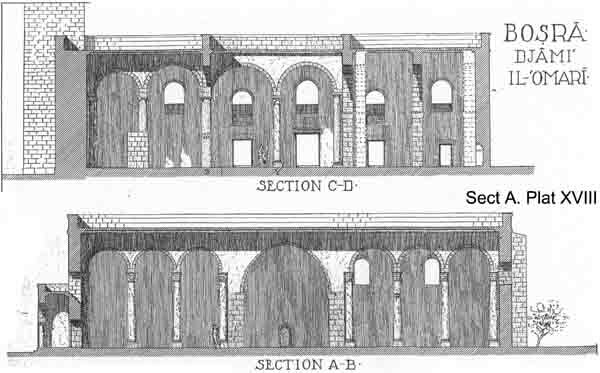 The arches of both arcades in these two bays lie parallel, and north and south. They carry their roofs of stone slabs intact. 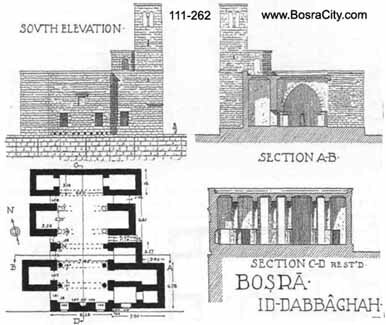 The next two columns to the north (Z), and the column east of it, both in basalt, carried each two pairs of arches at right angles to each other, in the Gothic manner. To accommodate this scheme a third column was placed against the east wall, but this is not part of a wall arcade. The spring-stones of the fourth arch carried by column (Z) are to be seen in 111. 256 at the extreme left. There has been much restoration in the northeast angle, and the northwest angle is a mass of ruins preserving one broken column in situ encased by piers on three sides. The north wall which is nearly intact is 2.50 m. thick, more than double 'the thickness of the other walls. The eastern portico is well preserved. It begins flush with the south wall of the mosque, but does not extend as far as the base of the minaret by about 2 metres. It is composed of a row of arches indiscriminately round and pointed, and carried on the stumps of Ionic columns taken from the ancient street colonnades. In a general way the arches are spaced so that the broader ones are opposite the entrances to the mosque, and that the narrower arches are pointed (111. 255), but these rules have several exceptions. The arches carry a corbel course opposite a similar feature in the wall, and the space between was roofed with slabs of basalt. It is evident that this portico is a later edition to the mosque, for it blocks up the lower half of two important windows. There are five of these large windows in the east wall, the middle one of which is pointed; the windows which flank it are set lower in the wall than those at the ends, and it is these that were partly closed by the roof of the arcade. The minaret is about 25 metres high, having a square tower-stair within, four tall narrow coupled openings of Romanesque appearance in the top storey, and a complete roof of stone. It does not belong to the original structure, but is probably an addition of the twelfth century. village. It appears incidentally in 111. 205, is in an excellent state of preservation, but is not in use. Its plan (111. 259) is very simple, the interior being a square of 7.40 m. spanned by two semicircular transverse arches carried on low piers. The walls are 1.10 m. thick, the doorway is only .90 m. wide, and the little windows which are set high in the wall are in several cases filled with stone grilles like those shown in 111. 260. The minaret which is slightly detached from the main building is of the same type as that of the great mosque, and belongs to the same period; the staircase within it is very narrow, but quite accessible. 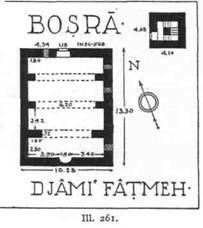 An inscription in Arabic gives the date 528 A. H.
of the same epoch as the Djami il-Khidr; but in ground plan (111. 261) it is a little longer and departs from the square. It is spanned by three transverse arches. The whole building has the appearance of having been often repaired. As this mosque was constantly in use, I did not wish to disturb the worshippers by taking measurements inside of it; and I am therefore indebted to my native assistant, George Cavalcanty, for the measurements given here. 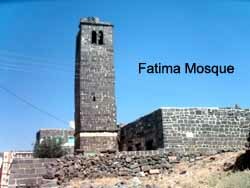 The minaret of this mosque is detached, and is not exactly placed in the plan presented herewith. 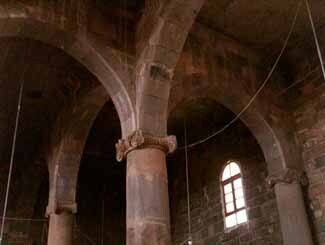 The parapet of its upper storey is partly in ruins, the call to prayer is given from the windows below. Early travellers saw the parapet in a perfect state of preservation. Two panels of a pierced balustrade of white marble are still in place, supported on either side by posts of basalt. These sections of balustrade are ancient, probably of Roman date, and may have come from the Palace. 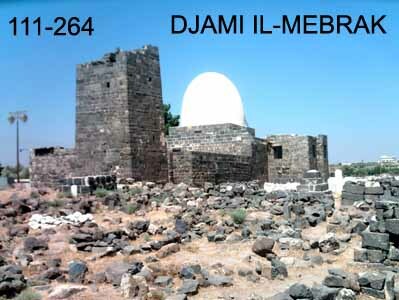 Id-Dabbaghah: 1225 a. d. This building, situated near the northeast angle of the great reservoir called Birket il-Hadjdj, and having its south wall flush with the wall of the reservoir, was perhaps not a mosque at all. 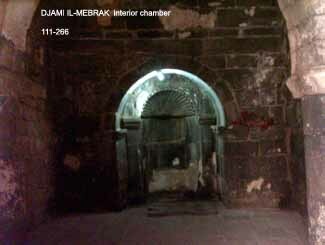 But it is certainly Moslem work, is dated in the thirteenth century, and has a mihrab in its south wall. The name signifies tannery; but whether it was itself a tannery, or was merely the mosque of the tanners, or of the quarter of the tanneries, is not clear. The plan (111. 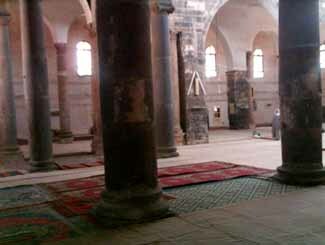 262) is totally unlike that of any other mosque in Bosra, or elsewhere so far as my experience goes. It consisted originally of a long hall spanned by six transverse, pointed arches (Sect. A-B) carried on short and slender columns, the third arch from the south end being carried by piers. The three southernmost arches are still in place although many of the stone slabs they supported have been carried away. 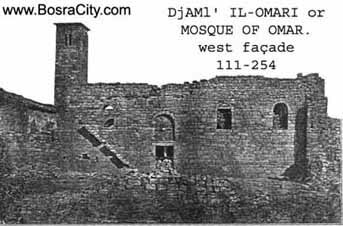 The south and north walls of the building are heavy, the former is pierced with a mihrab and two doorways; but the building has no side walls in the ordinary sense, but in their place a series of square exedras, each detached from the others, which open upon the long main hall. These almost independent structures are placed sufficiently near together (Sect. C.-D.) for the spaces between them to be spanned by the slabs of the roof, so that the roofing was continuous over all. This is certainly a very unusual kind of plan. At the southeast angle the building assumes a more connected plan (111. 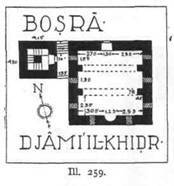 263); for here the minaret is situated, and a low octagonal tower, built to receive a dome, was placed beside it. The minaret is just like those described above, but for the fact that it has no stone stairs and no roof of stone. The south wall of the building was placed so near the reservoir that corbels had to be inserted at its base to carry a platform from which the south doorways could be reached. Between these doorways, but high in the wall, is a sunken panel with the Arabic inscription upon it which gives the date 622 A. H.
be assigned to the Nabataean period; but, with its inlay of white marble (111. 266) and its flat carving in imitation of Roman work, is probably to be assigned to some very good period of Moslem architecture, specimens of which are sufficiently rare in Syria. The chamber is spanned by a single transverse arch carried on columns, but is roofless in spite of its sanctity. Chamber (A) is an ordinary room opening into (C) by a broad arch. Chamber (C) is a square bounded by recessed wall-arches, and may have supported a dome. Chamber (D) is spanned by a transverse arch; it was filled with straw and was impossible to measure accurately when I saw it. It is said to have a prayer niche to the south. The whole of the eastern section of the building (E) was published by Professor Brunnow; but parts of it were left as doubtful in his drawing, Fig. 923. 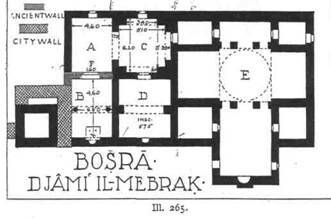 I have found his measurements to be correct and have embodied them in the plan; but I have omitted the two chambers flanking the south end of the main hall, as these do not exist, as may be seen in 111. 264. The cruciform part of the interior was originally covered with a dome at the intersection, if we read the old descriptions rightly , The chambers at the four angles are in two storeys.